Charles Schulz, wise philosopher and “Peanuts’” creator, once said, “All you need is love. But a little chocolate now and then doesn’t hurt.” Whether you like your chocolate dark and a little bitter, sweet and creamy or without any cocoa solids (AKA white chocolate) there’s no shortage of great places to get fine crafted sweets in Oklahoma. Here are the best chocolate shops in the state! This company comes from humble beginnings in Oklahoma. It was the Chickasaw Nation that took the brand to the next level. Bedre Chocolates are recognized nationally, but the company is committed to the local community. The factory is very interesting and makes for a nice stop on the trip between Dallas and Oklahoma City. The list of chocolates made at Glacier Confection will make you drool. They have a seasonal list that includes carrot cake, eggnog and pumpkin spice latte. The artisan collection is beautiful, with flavors like raspberry, champagne and orange. There’s also a vegan collection, a Cocktail collection and Caramel collection. Mix and match a box for yourself or for a gift. This chocolate shop imports its chocolate from Belgium. It’s located in the heart of the Rose District. Not only will you find artisanal Belgian chocolates, watch its social media pages for special events, like a fondue parties in November on Friday and Saturday evenings. You’ll need to make reservations. Guthrie is the perfect place to visit in December. The shops have an old-fashioned Victorian feel. You’ll want to indulge in some chocolate and coffee at this shop where they make chocolates, caramels and truffles. This chocolate shop boasts four Championships of the Norman Chocolate Festival. It’s got a long list of great treats, truffles, chocolates, bark and fudge. They also make a doggie-approved treat that can be given in moderation. 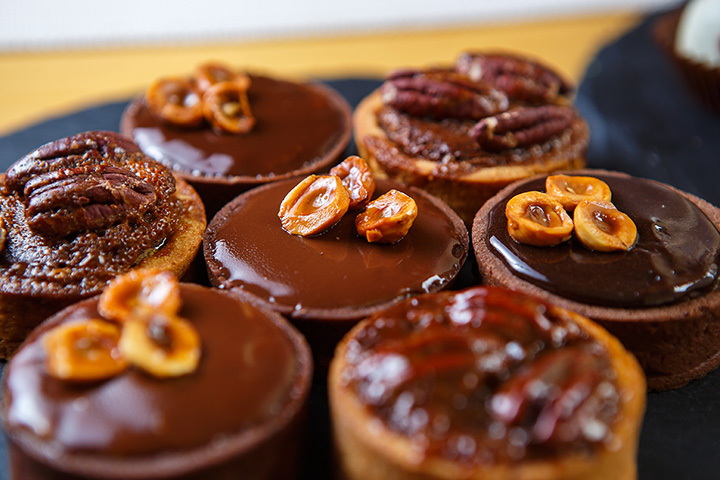 This bakery makes some of the best chocolate cakes, tarts and macarons in the state. If you’re looking for chocolate confections, this is the place to go. The best time to visit is during the weekend brunch. You’ll be transported to Europe while you enjoy a classic bistro meal. This candy store has a 90+-year history in Oklahoma City and it still makes candy like it did when it began. It is still family owned and operated, remembering the legacy of its owners and looking toward the future. The hand-crafted candies will melt in your mouth. This shop sells exotic chocolates and gelato. You’ll find a large selection of specialty chocolates, some are seasonal, some aren’t. Treat yourself to some chocolate when you’re in the neighborhood. Homemade chocolate covered cookie dough, chocolate dipped cherries and chocolate covered pecans, peanuts and raisins made in house at this sweet shop that gets its nuts from California. You’ll find a good selection of chocolate specialties. Although this shop is known for its fresh popcorn, it makes some delicious fudge in-house. On Fridays, buy four pieces of fudge and get two free. It’s a great place to stop by and take some chocolate-deliciousness home.